Seriously? OMG! 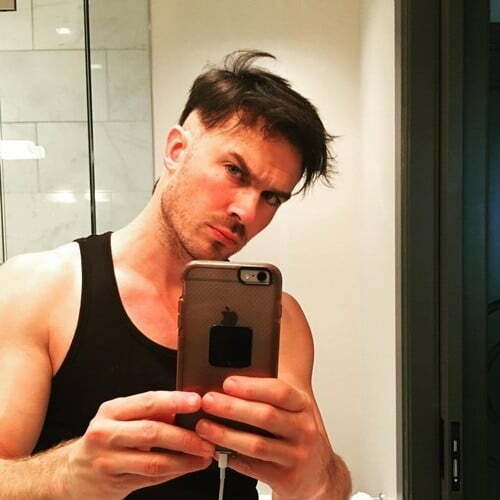 WTF?Ian Somerhalder reveals why wine and cutting your own hair don't mix - Seriously? OMG! WTF? « Eric Stonestreet is secretly gray? Ian Somerhalder had a few glasses of wine and thought, hey I want a faux hawk. Therefore, he took out the cutters and started buzzing away. Therefore, when the webseries comes out and it looks like he is wearing a wig, we will know why. Too bad he cannot replace hair like a Vampire replaces blood! Which sadly proves that he is not a Vampire. Or is he? Because he does not seem to age.